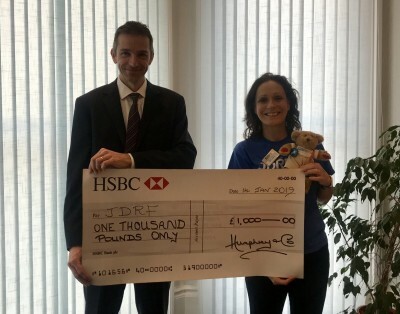 Every year our staff nominate a charity for the firm to support for the duration of the year, our charity for 2019 is the Juvenile Diabetes Research Foundation (JDRF). JDRF funds research into the cure, treatment and prevention of type 1 diabetes. It is their aim to help develop new treatments to keep people with type 1 as healthy as possible until they find the cure. Ultimately, they want to prevent people from getting the condition at all. To mark the beginning of our sponsorship Senior Partner Anthony Smith presented a cheque for £1,000 to Allison Tanner from JDRF. This amount is donated to our nominated charity each year in place of sending Christmas cards to our clients and business colleagues. If you look closely at the picture you will spot Rufus, the bear with type 1 diabetes, he has special felt patches on his test and injection sites to practice on. Rufus is included in KIDSAC, a pack given to children diagnosed with type 1 diabetes along with a handy type 1 reference folder to keep diagnosis information and leaflets together, a pocket guide for friends & family, a type 1 story book and a copy of Type 1 Discovery magazine all inside a drawstring bag. It costs approximately £20 to fund each pack, so as well as money raised being primarily directed towards research, fundraising also contributes to producing the KIDSAC. Our staff have already started fundraising for JDRF by signing up for the Eastbourne Half Marathon in March and taking part in the Make a Splash - virtual swim challenge, updates on their achievements will be posted here in due course. Further details about JDRF and the charities we have supported in previous years can be found here.